"Ted Nugent brought the 2008 Monsters Of Rock festival in Zaragoza, Spain to a halt after he performed a Native American raindance wearing full-feathered Native American headgear. The ritual came as Ted finished his set with 'Great White Buffalo', and the ensuing volent, 15-minute rain and hail storm destroyed all the production, staging and lighting, which ultimately forced the cancellation of the remainder of the event, including a performance from headliner Deep Purple. Be afraid, be very afraid." Set-list: Pictures Of Home / Things I Never Said / Into The Fire / Strange Kind Of Woman (for about 30 seconds, then a power cut, then about a minute of Paicey carrying on playing whilst the crowd carried on singing... About 30 minutes later the band resumed, starting with the second chorus) / Rapture Of The Deep / Contact Lost ~ Steve's solo (no riffs) ~ Well Dressed Guitar / The Battle Rages On / Demon's Eye / Don's solo - incl. Singing In The Rain / Perfect Strangers / Space Truckin' / Highway Star / Smoke On The Water (preceded by Here Comes The Sun from Steve) / Hush (incl. 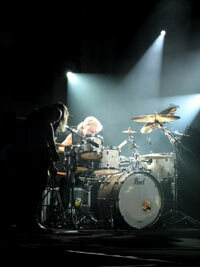 Ian's drum solo but without one-handed roll) / Black Night ( preceded by Roger's solo). Set-list: Pictures Of Home / Things I Never Said / Into the Fire / Strange Kind of Woman / Rapture of the Deep / Kiss Tomorrow Goodbye / Contact Lost ~ Steve Morse solo (no riffs) / Well Dressed Guitar / The Battle Rages On / Demon's Eye / Don Airey solo ~ Perfect Strangers / Space Truckin’ / Highway Star / Smoke On The Water. Encores: Hush (including Ian Paice solo, but without one handed drum roll) / Black Night (preceded by Roger Glover solo). Comparatively radically changed set-list! : Fireball / Into the Fire / Strange Kind of Woman / Rapture of the Deep / Kiss Tomorrow Goodbye / Contact Lost ~ Steve Morse solo (no riffs) / Sometimes I Feel Like Screaming / Well Dressed Guitar / The Battle Rages On / Maybe I'm A Leo / Don Airey solo ~ Perfect Strangers / Space Truckin’ / Highway Star / Smoke On The Water. Encores: Hush (including Ian Paice solo, with one handed drum roll) / Black Night (preceded by Roger Glover solo). "Approx 100 minutes. The best show so far. Paolo Kessisoglu (I gather that he's a TV presenter / comic) guested on "Smoke.."
Space Truckin’ / Highway Star / Smoke On The Water (Instrumental jazz version) ~ Smoke On The Water / Encores: Hush (including Ian Paice solo) / Black Night ( with Claude Nobs on harmonica, preceded by Roger Glover solo). "I do not know how they managed to arrange it, but Machinehead, a guitar shop in Hitchin, Herts managed to put together a guitar clinic with Steve Morse on 29th July. I got to hear about it as a customer who has spent a fair deal of money over the years in the shop, buying my son ever sophisticated and hence expensive guitars! The clinic took place in a conference room at the Letchworth Hall Hotel a mile or so off Junction 14 of the A1. I think that the event was part sponsored by Sound Man Guitars,and Engl amps. Steve was ushered in at 7.30pm and clinic was split into two sessions. The first was Steve demonstrating various techniques on the guitar, and following a short break the second half of the clinic concentrated on how his amps and foot pedals were set up, with further playing from Steve to illustrate what he was talking about. All of Steve’s playing was to backing tracks, none of which were Deep Purple related. Of the 200 or so of us fortunate enough to be in attendance, there were clearly a large number of guitarists. You could tell from the applause and looks of amazement on our collective faces after each piece of playing by Steve, that we were all witnessing someone at the height of his profession. Steve was happy to answer questions raised, most of which were interesting, even to someone like me who although a big fan, cannot play a note! Even when some cretin asked Steve to play Smoke On The Water, he obliged like a true gent. After the clinic Steve remained behind for a further hour to sign autographs and to chat. Judging from the whole evening, I get the impression that there is not an ounce of ‘rock star’ in Steve. It was a real thrill to meet such a genuine down to earth guy, who seemed happy to pass on his knowledge to mere mortals. When asked what gives him a buzz about being a musician , his reply ‘bringing out the best in fellow musicians’ seems typical of the man. 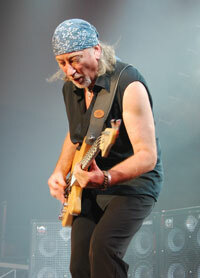 I have been lucky enough to see Deep Purple on half a dozen occasions since he joined. Although there still seem to be gripes re the set list etc I have never come away from a Morse gig with a feeling of being short changed or cheated. Compare and contrast to Blackmore! Looking forward to the next time DP tour the UK, hopefully in 2009, and to the next ‘Album'. Rapture of the Deep has really grown on me and is still getting a regularly played." "Let me start by saying just how much I love this band and what they do. Consummate musicians, great performers and great music. BUT.....I have never before come away from a Deep Purple gig before thinking I could have done better things with the last 90 minutes. The set list remains unadventurous, though I suppose the presence of Wring that Neck and the featuring of Sometimes I Feel Like Screaming from Purpendicular are both to be welcomed. However there is no point going on about the set list any more- we know what we are going to get so we have to judge the gig on that standard. The single feature which ruined the performance for me was the sound. The speakers simply could not handle the bass and resulted in an almost unlistenable to mess at time which is a great shame. The Glover/Paice dynamic has driven this band through all its best stuff yet the sound was such that it destroyed what pleasure there might have been from listening to them. The real pity of this is that Roger seemed in particularly fine fettle, skipping his way across the stage like a young 'un. Steve felt like the centre of attention and performed Contact Lost in particular quite beautifully which made it a shame that Sometimes... ended abruptly without an extended solo. Don enjoyed his solos spot introducing Perfect Strangers and he now feels integral to the whole - I miss Jon but did Don has made the role his own now which bodes well for the future. I have to say the sound did him no favours either - certainly on the heavier parts of his work. Ian P was...well...he was Ian P - unmistakable and brilliant. And yes, we got the one handed drum roll! Which brings me back to the bandmaster. Ian G. I would like to think that the performance last night was affected by the very poor sound - and he certainly was affected during Sometimes... with numerous gestures and communications to stage left and a conversation behind the drum riser. There were certainly enough good moments from him to suggest that the lungs are still there but I have become accustomed over the last couple of years to stronger performances than this from IG. One thing you can guarantee is that he gives it his all and doesn't shirk his duties - unlike a certain other frontman who deputised for IG in the mid 70s and who, great voice though he has (had?) now has to rely on band members and the audience to cover up his vocal deficiencies. Highlights were Strange Kind of Woman, Wring that Neck and Highway Star. The sound affected a number of the other tracks but even given the sound The Battle Rages On was disappointingly flat. Perhaps the biggest surprise for me was a perky Black Night, a track I have almost come to despise and which had me shuffling towards the back for a quick getaway when it came on. I can't remember enjoying the performance of that track as much as I did last night which is great because despite my disappointment at the show (largely I must say because of the sound not the band) they still sent me home smiling and hoping that next time, someone can supply some decent speakers rather than forcing Roger to bring his own from home! In addition, let's have smaller venues and a 2 hour set giving time for extended instrumentals and perhaps one or two surprise inclusions on the set list - anything from The House of Blue Light anyone?" Set List - Fireball / Into the Fire / Strange Kind of Woman / Rapture of the Deep / Kiss Tomorrow Goodbye / Contact Lost ~ Steve Morse solo ~ Sometimes I Feel Like Screaming / Wring that Neck / Well Dressed Guitar / The Battle Rages On / Don Airey solo ~ Perfect Strangers / Space Truckin' / Highway Star / Smoke On The Water / Encores: Hush (including Ian Paice solo) / Black Night ( preceded by Roger Glover solo). review: Charles Ashmore. photos: Alan Perry. You can see a full page of Alan's London 2008 shots in the DPAS photo gallery. "This band just continues to get better and better. Having seen every tour since Knebworth London 08 was deifinitely top 3 for me. The opening was awesome. A wall of noise then little Ian working his magic as Fireball kicked off and unforgettable night. Fireball turned into Into the Fire which, in turn, metamorphasised into SKOW. Big Ian's voice held up well enough and musically the band just rocked. Everyone was just enjoying themselves. Don Airey has left that shell he seemed to prefer to be inside and now leads many of the songs with an authority I did not think possible. Highlights? Rapture, Highway Star and Wring that Neck (which I had never seen live before). The band were definitely in some sort of 70s jazz-rock groove - many of the musical interludes belonged in the mid 70s and was just the icing on a very tasty cake. Gentlemen - thank you for an awesome concert. It was my 14 yr old son's first concert and any worries his musical tastes were straying towards R&B were blown away by Purple and, for that, I will be forever grateful!" Then there was a clip of Deep Purple live, a short interview with Ian Gillan (talking about not trying to be just "stars" and "modern" because being modern today meant being out of style tomorrow ....), and also an interview with the chief-monk, who is well known for his love of rock music. In fact he has a band and played as opener for DP! He joined the band for SOTW and you could see Steve smiling as he played the riff and the holy man came on with his black dress and a guitar..."
KB Hallen set list: 1. Fireball / 2. Into The Fire / 3. Strange Kind Of Woman / 4. Rapture Of The Deep / 5. Kiss Tomorrow Goodbye / 6. Contact Lost / 7. Sometimes I Feel Like Screaming / 8. Wring That Neck / 9. Well Dressed Guitar / 10. The Battle Rages On / 11. Don Airey solo / 12. Ted the Mechanic / 13. Space Truckin’ / 14. Highway Star / 15. Smoke On The Water / Encores: 16. Hush, with drum solo / 17. Black Night, starting with bass solo. "Deep Purple filled the KB Hallen to the last seat. After 20 or so concerts, I think this was the first time for me without Perfect Strangers in the set list. Instead we got Ted The Mechanic. I talked to Ian Gillan before the show and he said that he was getting tired off Perfect Strangers, so he wanted to drop it, and they did, unfortunately. It was quite obvious that they hadn’t played Ted for while. Gillan started the last chorus a bit early and Glover made a few mistakes when starting the last chorus, but the guys were laughing it off, so it didn’t really matter. They also struggled a bit through Sometimes I Feel Like Screaming but again they kept smiling, and managed to finish it off quite well. Gillan needed a couple of songs to warm up, but he’s in great shape, though maybe struggling a little with some of the higher notes. But come on, he’s 63 years old! August 8th 2008. Cloetta Center, Linköping, Sweden. The setlist: Fireball / Into the fire / Strange kind of woman / Rapture of the deep / Kiss tomorrow goodbye / Contact lost / Morse solo / Sometimes i feel like screaming / Wring that neck (short verision, one solo each for organ and guitar) / Well-dressed guitar / Ted the Mechanic / Don Airey solo / The battle rages on / Space truckin / Highway star / Smoke on the water / Encores: Hush (drum solo) / Glover bass solo / Black night. "Surprisingly good show with a nice balance between classic 'hits' and more obscure songs for us fanatics who know all their songs. Nice to still have two songs from their latest album in the set. As usual very well played. Don Airey seems to fit well in the band now, taking more space in the music. Ian Gillan had a slight vocal problem at the end of the main set but nothing that disturbed the show, what a fantastic entertainer he is! Glover did his job as usual. And so did Ian Paice. 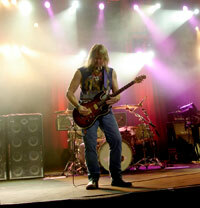 Steve Morse was the star of the evening. Set: Fireball / Into The Fire / Strange Kind Of Woman / Rapture Of The Deep / Kiss Tomorrow Goodbye / Contact Lost / Steve Morse Solo / Sometimes I Feel Like Screaming / Wring That Neck / The Well-Dressed Guitar / The Battle Rages On / Don Airey Solo / Perfect Strangers / Space Trucking / Highway Star / John Norum & Steve Morse guitar jam / Smoke On The Water (with John Norum) // Encore: Happy Birthday intro / Hush (including a short Ian Paice Solo) / Roger Glover Solo / Black Night. "Purple were in very good shape. Gillan's voice was superb, and it seemed obvious that they were really enjoying playing together. The opening band (Nazareth) were ok too, performing some their more famous songs such as Razamanaz ,and a couple of songs from their latest album. Setlist: Fireball / Into The Fire / Strange Kind Of Woman / Rapture Of The Deep / Mary Long / Steve's solo / Well Dressed Guitar / Sometimes I Feel Like Screaming / Wring That Neck / The Battle Rages On / Don Airey Solo / Perfect Strangers / Space Trucking / Highway Star / Smoke On The Water. 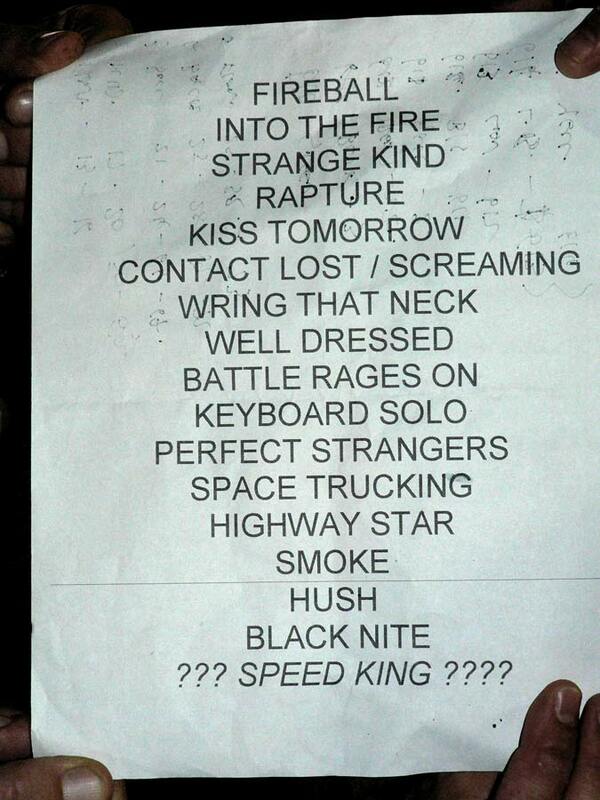 Encores: Speed King / Hush / Black Night." "A really fantastic show from Deep Purple at the Steinkjer festival, 120 km north of Trondheim. They started at 22.00 hrs sharp, and since the nights here in mid-Norway are becoming darker again, the light show came on during the concert. It was a clear and beatiful late summer evening, and 6,100 enjoyed every minute of the group's performance. The set list (see below) had no big surprises, Perfect Strangers was included, a favourite among the fans, and three encores were performed (Mary Long, Hush, and a lenghty Black Night with Steve Morse and the audience exchanging play and sing along responses - great fun for all!) Good sound all through the concert, and Ian's voice was in top shape. The band were very pleased with the show afterwards, and I don't think anyone went home disappointed, but instead enlightened by Deep Purple and what they still represent. For many seeing Steve Morse and Don Airey live was probably a ' first ', and Steve does not fail to impress any 'newcomer'. Many young people attended and there is clearly a new ' Purple generation ' experiencing and following the band nowadays. Personally I think this concert was even (slightly) better than the one I attended in Montreux in July. Norwegian television filmed part of the concert and aired a short clip of it on the 11 o'clock evening news on main channel NRK1. The local NRK radio and most of the mid-Norway newspapers in Trondheim and Steinkjer had long pre-show articles, interviews and positive reviews the day after. Set list: Fireball / Into the Fire / Strange kind of woman / Rapture of the deep / Kiss tomorrow goodbye / Contact lost / Steve solo / Well dressed guitar / Sometimes feel like screaming / Wring that neck / The Battle rages on / Don Airey solo / Perfect Strangers / Space truckin' / Highway star / Smoke on the water. Encores: Mary Long / Hush / Black night." review: Hans Peter Jenssen, Trondheim - photo: Anders Myrvold. Click here to see a full gallery of photos from the show. Set List - Fireball / Into the Fire / Strange Kind of Woman / Rapture of the Deep /Contact Lost ~ Steve Morse solo (including Back in Black by ACDC, Whole Lotta Love by Led Zeppelin) ~ Sometimes I Feel Like Screaming / Wring that Neck / Well Dressed Guitar / The Battle Rages On / Don Airey solo ~ Perfect Strangers / Space Truckin' / Highway Star / Smoke On The Water / Encores: 60s blues (a blues jam, the name of which escapes me) Hush / Black Night (including Roger Glover solo and Morse improvisation). The whole concert was amazing. I've never seen them live in the flesh, just on DVDs. Ian Gillan had his hair cropped, was pretty slim and his voice sounded incredible, much better than on the most recent Live in Montreux DVD. There were minor flaws, mainly by Steve Morse, but very little, perhaps some soundboard mixing problems. Also, I saw four cameras filming the whole show in great quality. I hope that this excellent concert film footage appears on DVD, either officially or bootlegged, because the band were in top form. Later I was interviewed by Europa Press (media agency of news) and made sure I mentioned that to them!." "First of all let me start by saying that yes, I’m in a fortunate position to be able to indulge my 35 year interest in all things Purple by taking a table at the 2008 Sunflower Jam. But, such was the organisation, effort and general great vibe created by Jackie Paice and her Sunflower team that even the less committed of my clients were totally blown away by the whole event. Sponsors and supporters of the event (myself included) were all made to feel very involved and an essential part of the evening and we were left in no doubt that the proceeds would directly benefit the Sam Buxton Healing Trust. A number of interesting and engaging acts peppered the evening during and between courses of an excellent meal (which was prepared by The Crooked Billet Team), but the music really kicked off at about 9.30 with the house band (including a very versatile Micky Moody on guitar) covering a range of Soul, R&B and Rock standards. Bruce Dickinson made a host of new fans with his set covering Ike and Tina Turner and Joe Cocker in impressive style. 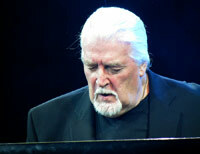 Jon Lord joined the band for a rousing version of Walking In The Shadow of the Blues. There was a brief interlude before Deep Purple came on to the stage with Pictures of Home and proceeded to knock out a highly enjoyable, shortened version of the most current set list, with Wring that Neck, and Well Dressed Guitar being highlights for me. The big 'Jon Lord and Deep Purple' re-uniting thing was thankfully not built up on the night, with Jon dipping in and out of the set, swopping places with Don Airey, or playing alongside him. Ian Gillan had an absolute stinker of a cold and was clearly struggling, but like the trooper he is, made the very best of what he had left in the tank. The rest of the band were clearly very relaxed and having a good time. I’m pretty sure that the band's gear was not their own, with Steve Morse using some particularly dodgy looking guitar hardware. I am pleased to say it made not one jot of difference, and the band certainly won over my ‘corporately hardened’ guests by the time Hush was in full swing. It was a real privilege to be part of the evening and to get this close to a band that I have followed and watched (often from bloody miles away) over the years." review & photo: Steve Curtis. Click the pic to see a full gallery of Steve's Sunlower Jam photos. "Six months ago, when I bought my tickets, I wasn´t sure whether the set-list would be worth the Euros or not. With no new album it would be either the same old Rapture Of The Deep set-list as in Kiel 3 years ago, or just another best-of revue, or so I thought. I should not have worried. With a fun and energy level so high throughout a concert lasting for more than 125 (!) minutes Purple can do no wrong. Glover's bass pumped right into our stomachs (especially during Wrong Man, Into the Fire and Black Night); Gillan screamed - not only sometimes - but as if there was no tomorrow; and Paice had us open-mouthed with his one hand drum roll. But the real star of the show was Steve Morse, with new solos all over the place and rhythm work more prominent than the rest . My only complaint is that Don Airey was too far back in the mix with his otherwise brilliant keyboard work. After the opening bravado of Pictures Of Home, Things I Never Said and Into the Fire, Strange Kind Of Woman was rearranged almost into a new song. With five newer songs (i.e. Rapture of the Deep, Wrong Man, Contact Lost, Well Dressed Guitar and the Purpendicular stand out Sometimes I Feel Like Screaming) all in a row, no one can say Purple ignore their Morse years. But the best was yet to come: after hearing long lost gems Wring That Neck, The Battle Rages On and Mary Long I was over the moon. The mighty Perfect Strangers, Smoke On The Water and Space Truckin´ made for a grande finale. But the band was so fired up by the reaction of the capacity crowd in the sold out sports arena that they didn´t hesitate to return, almost immediately, with a lengthy and true to the original version of Lazy. Singing along with Hush, Black Night and, finally, Highway Star ruined our collective voices... For each and everyone in the crowd it was a night to remember. Even more so for me, because for the first time I had my twelve years old son coming with me to see the band I had loved and followed for a good third of a century (yes, I´m 47 years old - thanks but no thanks for asking). Saw the band in Stuttgart yesterday, Nov 08th. They changed one song in the set, Mary Long was replaced by Knocking At Your Back Door. Fortunately, as Knocking At Your Back Door is the better song and also a crowd pleaser. Which leads me to the only weak point, the opener. I don’t understand why they stick to Pictures of Home. As good a song it is, it´s not suited as opener. It should be replaced by Fireball, Woman From Tokyo or Speed King, songs which they didn´t do,and which I´m sure would create more energy and enthusiasm in the audience. Things I Never Said has of course the same problem, and therefore they waste the initial energy of the audience. Apart from that it was a very good concert, I enjoyed it much more than last time in the same place (Feb 2006). Ah yes, Lazy was done as first encore, along with Hush and Black Night. Pictures Of Home / Things I Never Said / Into The Fire / Strange Kind Of Woman / Rapture Of The Deep / Kiss Tomorrow Goodbye / Contact Lost (dedicated to Pyro) / Steve's solo ~ The Well-Dressed Guitar / Knocking At Your Back Door / Sometimes I Feel Like Screaming / Wring That Neck / The Battle Rages On / Don's solo ~ Perfect Strangers / Space Truckin' / Highway Star / Smoke On The Water. Lazy / Hush (incl. drum solo) / Roger's solo ~ Black Night. Pictures Of Home / Things I Never Said / Into The Fire / Strange Kind Of Woman / Rapture Of The Deep / Kiss Tomorrow Goodbye / Contact Lost (dedicated to Pyro) / Steve's solo ~ The Well-Dressed Guitar / Knocking At Your Back Door / Sometimes I Feel Like Screaming / Wring That Neck / The Battle Rages On / Don's solo ~ Perfect Strangers / Space Truckin' / Highway Star / Smoke On The Water. Hush (incl. drum solo) / Roger's solo ~ Black Night. 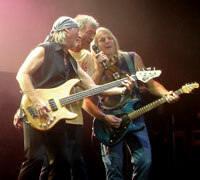 "Around 6,500 people showed up for one of the last shows of this leg of the Deep Purple 40th Jubilee Tour. Gotthard opened the evening with a good show. Steve Lee is still a great singer, and they were a perfect band to warm up the audience. 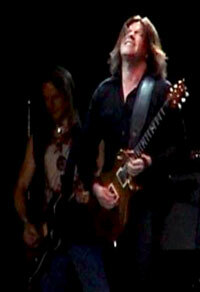 I haven´t seen Deep Purple for a couple of months, the setlist was getting too familiar for me. So I was curious to see how I would feel to be back. I must say, it felt good. Not many changes in the set list, but it was a perfect balance. As usual they opened with Pictures of Home, then straight into Things I Never Said and Into the Fire. A couple of songs later Steve performed Contact Lost which was dedicated to Pyro. For those who don´t know: Pyro, real name Klaus Porzia, was a photographer, frequently seen around with Deep Purple. A nice guy, always ready for a chat and a laugh. He got his nickname by throwing away a cigarette into a pyrotechnic contraption. Too bad he couldn´t take pictures of what happened afterwards! I was glad they played Knocking At Your Back Door. Great to hear that song again! During Sometimes I Feel Like Screaming Roger and Steve sang along with Ian, who made it difficult for them by sitting down and turning around, just having fun on stage! Wring That Neck was dedicated to Ian Gillan´s mother, who had said that it is a great track (and I hope she didn´t say that just because Ian isn't singing on it). During Don´s solo I was afraid the building would collapse, because I had heard him practising a few hours before the show. Highway Star was superb, with a nice guitar and bass intro, different from before. After the show Roger said that they have new plans for something surprising and that they are working on it, no idea what that might be. No plans for a new album yet, he said what´s the use of making a new album if no-one buys it! (gaaahh!!!) Finally, a tip for the coming months: check out Don Airey, he is about to tour to promote his solo album A Light in the Sky!" review and photo: Peter Rossen. Click the pic to see a full gallery from the show! Pictures Of Home / Things I Never Said / Into The Fire / Strange Kind Of Woman / Rapture Of The Deep / Kiss Tomorrow Goodbye / Contact Lost (dedicated to Pyro) / Steve's solo ~ The Well-Dressed Guitar / Knocking At Your Back Door / Sometimes I Feel Like Screaming / Wring That Neck / The Battle Rages On / Don's solo ~ Perfect Strangers / Space Truckin' / Highway Star / Smoke On The Water. Lazy / Hush (no drum solo) / Roger's solo ~ Black Night.